Federal officials opened a formal investigation against former Brazilian president and likely 2018 presidential candidate Luiz Inácio Lula da Silva, 69, on allegations of influence peddling. Lula is suspected of intervening on behalf of contractor conglomerate Odebrecht and winning them lucrative foreign contracts, according to Folha and Globo . 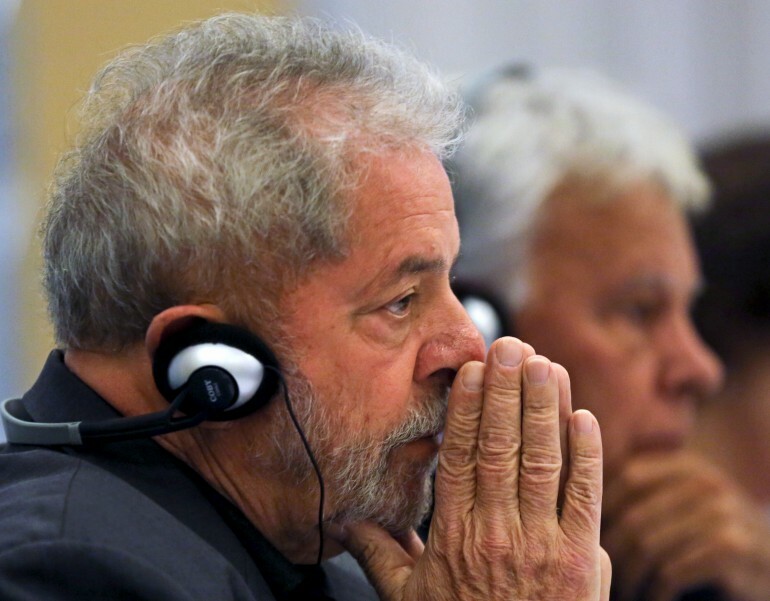 A spokesperson for Lula has denied any wrongdoing. The investigation is part of a set of separate but interweaving investigations and scandals plaguing Brazil and Lula’s ruling Worker’s Party that escalated on Friday (see below). Did Lula use his influence abroad illegally? Investigators are looking Lula’s overseas trips paid for by Odebrecht to Cuba, Panama, Venezuela, Dominican Republic and Angola between 2011 and 2014. Citing news articles , they say that Lula helped Odebrecht secure contracts in those countries. Former CEO Marcelo Odebrecht, 46, admitted that Lula’s help was significant in the case of Cuban contracts, in an April interview with Exame , two months before he was arrested in a separate before he was arrested as part of Operation Car Wash (Lava Jato), a separate bribery scandal. “The only country where in fact we have gotten started and grown and have say that they relationship [with Lula] helped a lot is Cuba,” said Odebrecht the CEO. The company later released a statement to Folha clarifying that travel provided to Lula was not leverage his help directly for the company but "to give lectures for businessmen, political leaders and opinion makers in events aimed at defending the potential of Brazil and its companies." Were Lula’s appearances intervention on behalf of all Brazilian companies or specifically meant to benefit Odebrecht? Whether or not Lula’s actions constitute “peddling of influence,” will be decided by the courts, and a decision to prosecute might hinge on Lula’s alleged compensation. Federal authorities are also investigating Lula’s alleged support of a loans to Odebrecht from BNDES, Brazil’s nationally-owned development bank. Support for investigations against Lula, Odebrecht and the BNDES grew on Friday as part of a “revolt” against the Worker Party. Spearheaded by PMDB (Democratic Movement) party leader and Speaker of the House Eduardo Cunha , support for investigations coincided with a defection from the coalition, crippling the government legislatively. His defection is partially a reaction to being implicated (falsely, Cunha says) in the same bribery scandal that led to Marcelo Odebrecht’s arrest; the Lava Jato. That money laundering scheme took place when current president Dilma Rousseff was head of Petrobras, the state oil company that’s central to the pay-to-play scheme for major government contracts with construction companies that allegedly including Odebrecht. Incensed that he has become a target of the Lava Jato investigation, Cunha seemed to be declaring a “war” on the Brazilian government, in the words of Brazil corresponded Ben Tavener. The wide-ranging bribery scheme is interchangeably called Petrolão because of Petrobras’ large role and echos the largest scandal of Lula's own presidency, a bribery scheme known as the Mensalão. Declaring war on govt, Cunha approves 4 inquiries, incl. into #BNDES loans. Some predict scandal that could eclipse both Petrolão, Mensalão. Brazilians took to twitter on Friday using the hashtags “Cunha in prison,” “Cunha the coup man” and “Cunha explodes the government.” Folha contributor and LA Times correspondent Vincent Bevins tweeted that the social media response was bad news for the legislator. Cunha is also threatening lead Rousseff’s removal from office through impeachment -- a process so unprecedented in Brazilian politics that the word itself is an Americanism. There are plenty of reasons why Rouseffee won’t be impeached (veteran Brazilian journalist Mauricio Savarese writes about ten of them ). Yet it’s become a rallying cry against a deeply unpopular president, who less than a year after reelection has seen her approval rate drop to around 10 percent. The current web of scandals in Brazil coincide with an economic one. After decades of growth and an exodus of citizens from extreme poverty into respective living standards, the country is dipping into a possible recession. Observers fear that a collapse of the government could prevent it from passing needed legislation to deal with its economic challenges.